Northern bottlenose whales are the largest species covered by the ASCOBANS Agreement. 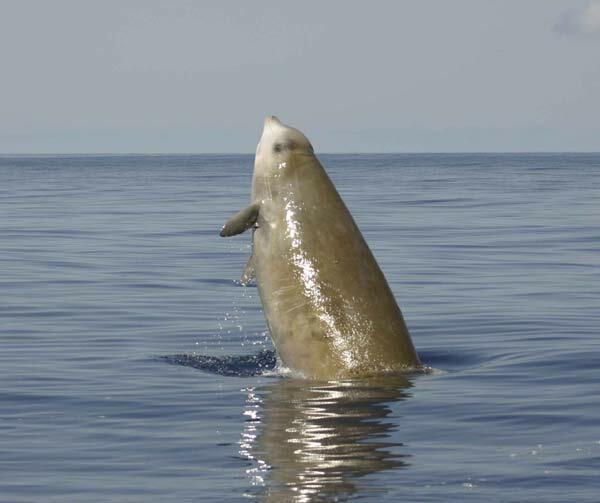 They are the best-studied member of the deep-diving beaked whales. At least three additional beaked whale species (Ziphiidae) have occasionally been reported in the North Sea. Cuvier's beaked whale Ziphius cavirostris, Sowerby's beaked whale Mesoplodon bidens and True's beaked whale Mesoplodon mirus are also oceanic, deep-diving species with few teeth that feed primarily on squid. 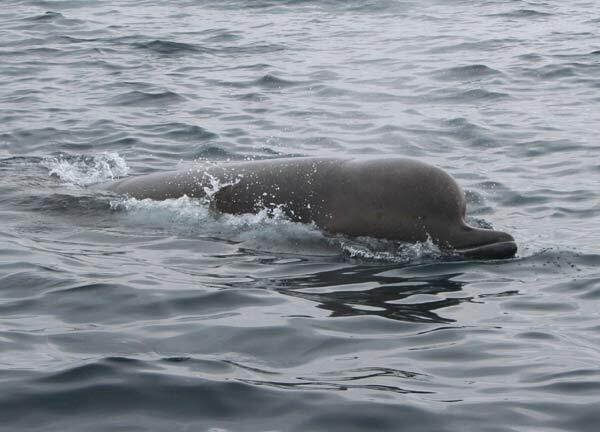 We know relatively little about all beaked whales; some species have never been seen alive. Northern bottlenose whales are excellent divers, capable of diving for over one hour and deeper than 800 metres. Individuals are normally found in small groups from 1-20 animals. Nothing is known about their social organization. Northern bottlenose whales are named after their long tube-like snout, distinctly separated from their melon-shaped forehead. Adult males develop a very steep and bulging forehead with a squarish profile and can reach almost 10 m in length. They are chocolate brown to yellow in colour, and lighter on the flanks and belly. Newborns are grey with dark eye patches. As is characteristic of most beaked whale species (Ziphiidae), they have few teeth, and two conical teeth at the tip of the lower jaw appear in adult bulls only. Beaked whales are generally shy and inconspicuous, but northern bottlenose whales sometimes approach boats. Whalers exploited this curious behaviour in the past. They feed primarily on squid, occasionally on fish, such as herring and redfish, as well as on benthic invertebrates, such as starfish and sea cucumbers. The species is endemic in the cold temperate to sub-Arctic North Atlantic and prefers deep offshore waters, mostly seaward of the continental slope. They are most common in the northern waters of Nova Scotia up to Iceland, off western Norway and the Barent Sea and show seasonal migratory movements. They also enter the northern North Sea. There are no estimates of abundance available. Northern bottlenose whales were extensively hunted until the 1970s. More than 80,000 whales were killed during this period, which began in the 1850s, and many were harpooned but not recovered as they tended to dive down and sink after being harpooned. There is not much evidence of northern beaked-whales being caught incidentally in fisheries. All beaked whales seem to be particularly vulnerable to loud man-made noise. Mass strandings in the last 20 years have lead to increasing concern that military sonar can cause injury and death. Habitat destruction and overfishing are additional threats. Northern East Atlantic Poor 4,171 (CODA Survey)* Project Report: Review of Trend Analyses in the AS [more] The population size estimate is based on data collected during SCANS-II (2005) and CODA (2007) surveys. See the previous Trend Analysis document for more details. SCAN-II and CODA reports can be found in the additional notes section. *Note: the estimated population size is for the whole survey area and not just for the Northern East Atlantic. The separate estimate for this region is not available. Northern Bottlenose Whale sightings all occurred during the CODA Survey. Central East Atlantic Poor 4,171 (CODA Survey)* Project Report: Review of Trend Analyses in the AS [more] The population size estimate is based on data collected during SCANS-II (2005) and CODA (2007) surveys. See the previous Trend Analysis document for more details. SCAN-II and CODA reports can be found in the additional notes section. *Note: the estimated population size is for the whole survey area and not just for the Central East Atlantic. The separate estimate for this region is not available. Northern Bottlenose Whale sightings all occurred during the CODA Survey. Bay of Biscay Poor 4,171 (CODA Survey)* Project Report: Review of Trend Analyses in the AS [more] The population size estimate is based on data collected during SCANS-II (2005) and CODA (2007) surveys. See the previous Trend Analysis document for more details. SCAN-II and CODA reports can be found in the additional notes section. *Note: the estimated population size is for the whole survey area and not just for the Bay of Biscay. The separate estimate for this region is not available. Northern Bottlenose Whale sightings all occurred during the CODA Survey. Northern North Sea Poor 4,171 (CODA Survey)* Project Report: Review of Trend Analyses in the AS [more] The population size estimate is based on data collected during SCANS-II (2005) and CODA (2007) surveys. See the previous Trend Analysis document for more details. SCAN-II and CODA reports can be found in the additional notes section. *Note: the estimated population size is for the whole survey area and not just for the Northern North Sea. The separate estimate for this region is not available. Northern Bottlenose Whale sightings all occurred during the CODA Survey.